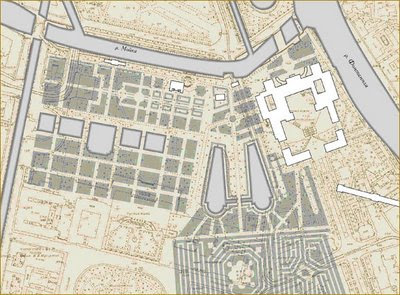 The Third Summer Garden and its surroundings according to the third General Layout of St. Petersburg. Copied from an 1820 layout, prior to the renovations below. Map regressions are a standard tool of the garden historian. They're like time travel really--all the historical geographical records are assembled and registered to definite landmarks so that changes in the landscape features over time become visible. This isn't easy; much of the information is incomplete at best. Some 'maps' may be only hand-drawn sketches without scale or compass markings. 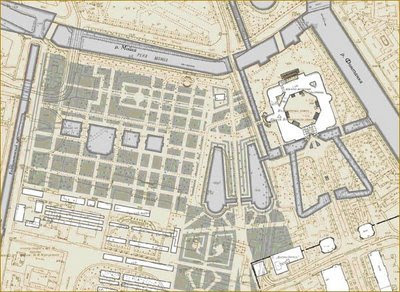 A map of a neighboring property or an old photograph might show only a piece of the garden. Government documents often mark roads and bridges and bodies of water, but no garden features. Textual descriptions can be hard to relate to facts on the ground. And registration of features, especially in amateur maps, can be inaccurate. Royal gardens are better documented than most, however, and it is the lucky garden historian that ends up with as complete a record as the series above, for the Mikhailovsky gardens in St. Petersburg, originally laid out by architect J.B. Leblond for Peter I in 1716-1717. 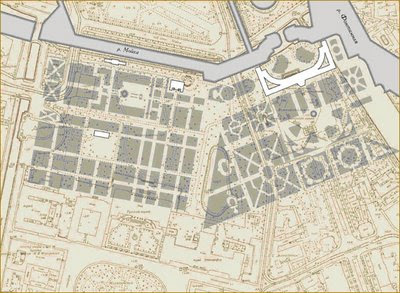 This is of interest to garden history, but map regressions are often prepared in anticipation of a garden restoration and so the problem in the twenty-first century becomes which garden to recreate? It is a serious question in historic landscapes, which have multiple layers of time and meaning. Often, the most recent style is the easiest one to which to return. Traveling further back in time could require the removal of the top layers--layers that might include mature trees, or extant landscape features like ponds to which contemporary visitors have become attached. Rarely, though, a connection to some serious historic event, or the need to provide the proper setting for a significant piece of architecture, make the return to a more distant time an appropriate choice. 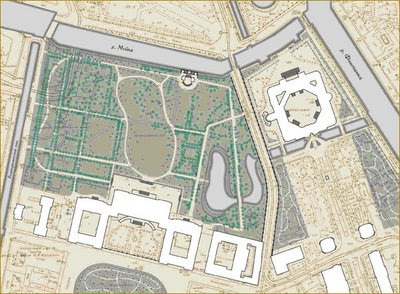 In the Mikhailovsky garden, a reconstruction project carried out by the State Institute of Architecture in St. Petersburg in 2001 returned the garden to its most recent designed layer, the naturalistic English landscape park of 1822. Its map will someday serve to mark the layer of the twenty-first century for a garden historian of the future. What a nice surprise to find a post with such familiar dear names. I enjoyed reading. Thanks! Glad you enjoyed it...St. Petersburg is one of my dream destinations.